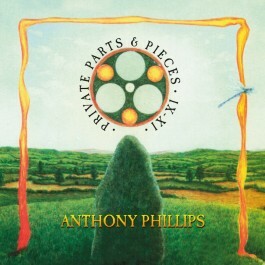 Forever tagged with the label of ex-Genesis guitarist albeit a significant member in their formative years, Anthony (or just plain ‘Ant’) Phillips has continued to plough his own musical furrow. Building up a vast library in a catalogue that’s crossed boundaries and genres, his Private Parts & Pieces collections have remained a constant delight for fans. First given away as a bonus album (or cassette as mine was) for early purchasers of his Sides album, his Private Parts & Pieces outpourings have developed a life of their own. Now into the third and final and probably definitive collection, Part IX of the series, Dragonfly Dreams, sees an initial focus on his first instrument and a selection of guitar pieces. In the main, calming and measured, Sarah Blakeley’s Evening pierces through, ringing its charms, like his much more pleasant sounding version of Genesis’ Pigeons and Still Time highlights once again his prowess on the twelve string. There’s a rare vocal on She’ll Be Waiting. Featuring four independent Stratocaster parts and despite the generally congenial performance, a rather sad composition. The sort of minutiae that you’ll find contained in the detailed booklet. Lostwithiel sees the a shift into a series of pieces in the Oldfield/ambient/new age instrumental field, explored further on the more electronic percussion led Lost And Found and Night Song. However, Chinese Walls which will cause a slight shiver of excitement amongst those of a more progressive bent, although conversely its seventeen cinematic minutes seem to drag a little. Dating back to 1986, its difficult gestation suggests that I a piece that fell prey to constant tinkering and not quite the finished article, yet that’s perhaps what PP&P is all about. Part X, Soiree, is as it sounds; a series of solo piano pieces that would fit perfectly at a classy dinner party, probably even for someone would could even afford to hire Mr Phillips as the subtle entertainment for the evening. The tendency is towards the moody classical and easy paced rather than offer the type of variety that you’d get with say the more jovial Rick Wakeman. Perhaps the least essential of the sets. City Of Dreams – Part XI – I smuch more interesting despite being 31 assorted sketches that in the main, sit as undeveloped sketches, ideas for what might be, including four parts of the title track and three Mystery Trains. Once again, the new age designs and directions are developed with a series of snapshots of possible starting points for more extended compositions. Washes of synths drift and dominate an air of easy calm and tranquillity. Sunset Pools, Stars End, Realms Of Gold – the titles say it all, although Piledriver perhaps overstates the case for a bass synth led industrial experiment while Astral Bath could fit comfortably on anything by Vangelis. An extra disc, bizarre really, extras upon the extras, include a couple of alternate mixes and some pieces that you wonder why they didn’t make the original, or at least an earlier cut. Mixing more piano pieces with another collection of ambient doodles, High Roller cuts through with the steel strung acoustic as does Brand New Cadillac, despite sounding like it should be a dirty blues; both further examples of the Phillips acoustic guitar magic. Without question, for his fans, which may well be a niche market, Phillips has continued to offer the sort of transparency to his work that’s refreshing. There can’t be many stones left unturned, or tape boxes gathering dust in his archive.